Each year, JEDEC acknowledges the contributions of member company volunteers who have demonstrated outstanding effort and dedication in their work towards the development of open industry standards in JEDEC, beyond the normal scope of committee activities. Candidates are nominated by their peers, and the final honorees are determined by the JEDEC Board of Directors. JEDEC is honored to congratulate 2013 award winner Daniel Miller and his company, M.S. Kennedy. 2013 Award of Excellence honoree, Dan Miller. The Award of Excellence is the most prestigious award bestowed by the Association, and it recognizes an individual’s sustained service to JEDEC and the standards community. In 2013, Daniel Miller of M.S. 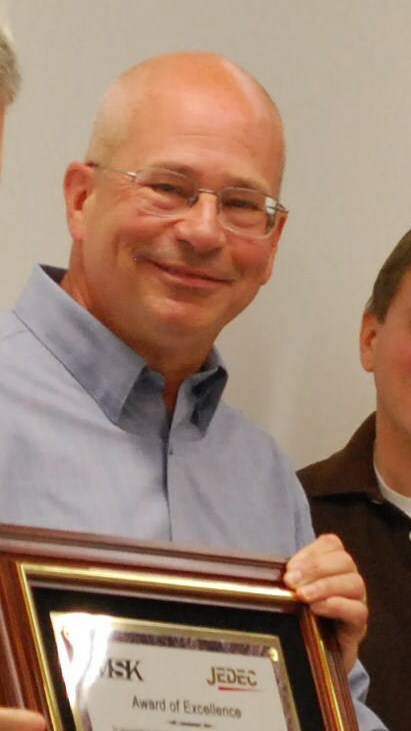 Kennedy received the Award of Excellence in recognition of his leadership as Chairman of the JC-13.5 Subcommittee on Hybrid, RF/Microwave, and MCM Technology, and his contributions benefiting the industry through his work on JEDEC standards and test methods. M.S. Kennedy hosted a reception at its offices in Liverpool, NY in July, where John Kelly, JEDEC President, presented the award plaque. Mr. Miller has been an active JEDEC participant for over 25 years, and has served as Chairman of the JC-13.5 Subcommittee since 2001. During Mr. Miller's tenure as Chairman, numerous JEDEC test methods and documents have been incorporated into mil specs. This work has resulted in significantly improved quality and reliability of the electronics used by the U.S. armed forces as well as cost savings for the industry. "Dan is an exemplary leader and industry member, who has tirelessly worked to make the specifications and documents for our industry and our customers much better." "Dan is a good listener, and greets new challenges with a positive attitude towards resolution." "He is fair and unbiased, remains calm and in control and gives every company representative ample time to consider and give input on the topic at hand... Dan is always pleasant, courteous and professional, injecting humor when appropriate but never at anyone's expense."